Is Window Condensation During The Winter Months Normal? 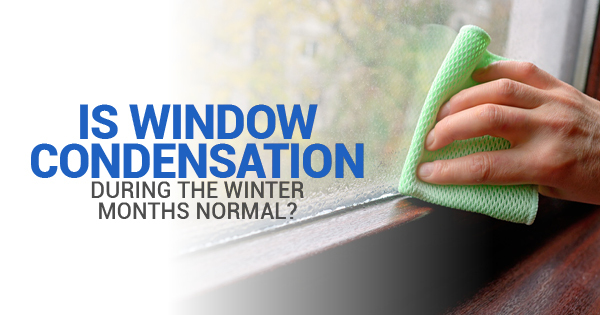 With winter on the way, you may have noticed a surprising side effect on your windows: condensation. Homeowners often don’t think much of condensation because it’s a natural phenomenon we see all the time. However, window condensation can be damaging to a home if it isn’t taken care of. Common housing damage that may be caused by interior humidity includes rotting foundation, deterioration of insulation, rotting wood, and peeling paint. Window condensation during colder weather is caused by excessive moisture in the home. Usually, this is the result of the interior of the home being much warmer than the exterior of the home. As a result, the warm air within the house condenses and beads on the windows as condensation. However, when condensation forms on the outside of the window, it’s the result of the window being colder than the dew point resulting in the external air condensing against your glass. When condensation appears between the window panes, it often means the seal between the window panes may be damaged. A saturated desiccant within the windows may be another cause. What can be done about window condensation during cold weather? You may want to consider getting a dehumidifier if the condensation on your windows is coming from the inside and not between the panels. In these cases, it’s the humidity in your home that’s the problem, not the condensation itself. Clean the windows. Clean off your windows before assuming the fog on the glass is the result of condensation. The misted windows may be the result of cleaning product buildup rather than moisture. Window pane replacement. Should condensation be the cause of your misted windows, you may need to replace the glass units depending on the age of your residential windows. Replacement windows. If you can’t replace the glass units of your windows or the damage of the condensation goes beyond the glass units, you may need replacement windows. Replacement windows from a home window company are a good investment if your windows have been reaching their age limit. With proper maintenance, windows typically last up to 20 years. Condensation buildup on your windows may be a sign of excessive interior humidity or a problem with your window panes. If you’re in need of a residential window installation and replacement, contact Best Windows Inc. today.